Do you love to dance? Or does the mere thought of having to get out on the dance floor turn you into a bundle of self-conscious nervous energy? Dancing is one of those things that you either love or just don’t do. There’s not a lot of middle ground. But did you realize that you can actually forget HOW to move? Of course, you move everyday, but I mean the kind of movement your body was designed to do. That’s what we’re talking about today. Movement and how you can find your personal style of movement again and allow your body to do what it does best…..even if it hasn’t done that in years. My guest today is Debbie Rosas, the co-creator and founder of the dance based cardio workout, Nia Technique. Nia includes movement from dance, yoga and martial arts, all based on the body’s intelligent design. A Nia class can be called exercise but it’s much more than that. Really it’s a holistic workout that combines elements of personal growth focusing on the body’s comfort and pleasure within movement. 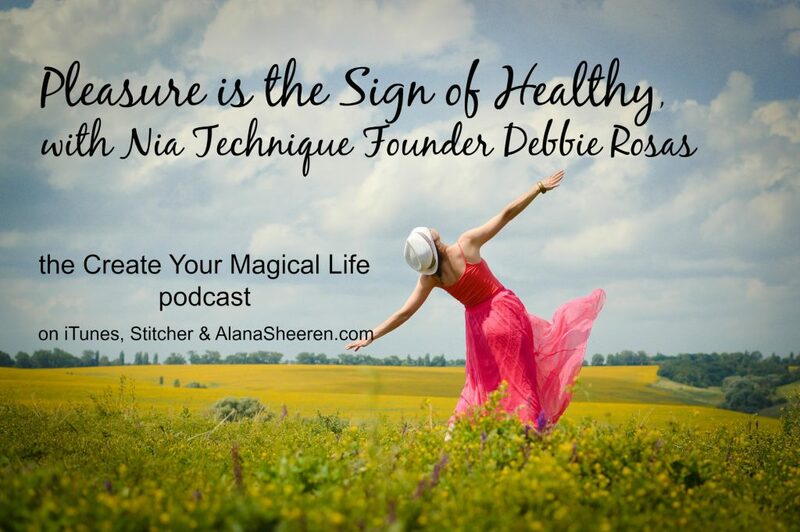 Debbie is a fitness innovator, teacher, author, choreographer, performer, healer, and artist. She can explain Nia Technique best. Nia has benefits ON and OFF the dance floor! Nia is not just a structured exercise program, but is highly personalized and holistic. What will you see when you first enter a Nia class? Debbie explains. Free dance is a huge component of Nia. Find out about the balance between structured and unstructured movements. The healing arts are part of Nia’s holistic nature. Are you curious about the birth of Nia? Debbie explains how she made the discovery that led to the technique’s development. Your body has SO MUCH MORE potential than just to be exercised! Part of Nia’s beauty is the complete uniqueness of every Nia instructor. A Nia class will be a potpourri of all kinds of people with every level of dance experience. At its core, Nia is about change and exploration INSIDE and OUTSIDE the lines. Nia incorporates 52 basic moves to be used for healing the body—and they can be adapted for ANY needs. Debbie explains several Nia components: Dancing through Life, Living Meditation, Life as Art, and the 13 Joint Map. Want to know more? Join us! Also in this episode, we meet Ashton Szabo from Sivana Spirit. They are an online store dedicated to helping people live with spirit. The company focuses on education about eastern philosophy, spirituality, yoga, conscious living, and giving back. Check them out in our resources section below! This entry was posted in Podcast and tagged body movement, dance, debbie Rosas, learn to move, movement, nia class, nia studio, the in technique. Bookmark the permalink.